Large numbers of photographs were produced during the Civil War and are of great assistance in understanding the uniforms of the period as actually worn. There were a number of types of photographic techniques used during the period. The earliest form of popular photography was the Daguerreotype. This was the work of a Frenchman, Louis Jacques Mandé Daguerre, whose invention was first demonstrated to the public in August 1839. It used a polished copper plate coated with silver iodide and was developed by being exposed to mercury vapor and was washed with sodium hyposulphite. 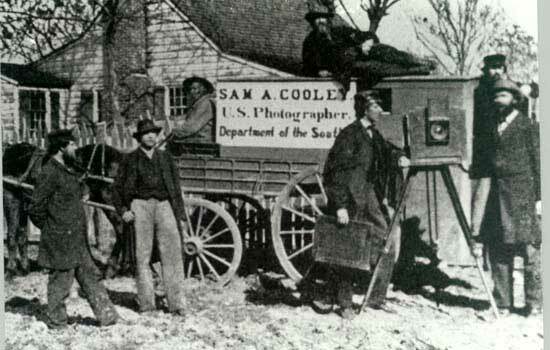 Exposure times were prolonged with Daguerreotypes and required as long as 15 minutes. The Daguerreotype was introduced to the United States by Samuel Morse, who was visiting France at the time and ordered a camera built to Daguerre's specifications. In 1840 Morse, better known as the inventor of the telegraph, offered a course of instruction in photography. Among Morse's very first students were Mathew Brady and Edward Anthony. The Calotype was developed by an Englishman, William Henry Fox Talbot also in 1839. Talbot was the first to use photographic paper, negatives, positives and development techniques. Talbot had been working on his techniques since 1835 and made it public when word of the Daguerre process reached England. Early Calotypes produced a less distinct image than that produced by Daguerreotypes. 2 3/4 x 3¼ "
The next advancement was the Ambrotype introduced in 1851. It used a glass plate with a dark backing to form a positive image. The process was developed by Frederick Scott Archer, an Englishman, using a collodion that adhered to a glass plate. This was bathed in silver nitrate and had to be kept moist (therefore the name "wet plate"). The plate was developed with ferrous sulphate and fixed by potassium cyanide. Early photography involved the use of many toxic chemicals. The Ambrotype soon supplanted the Daguerreotype. A modification of the Ambrotype was the Tintype or Ferrotype, which was produced on thin japanned "tin plate" (actually iron) and was less expensive and more portable than the ambrotype. Tintype photographs could be sent through the mail. At the time of the Civil War Ambrotypes and Tintypes were still in wide use. 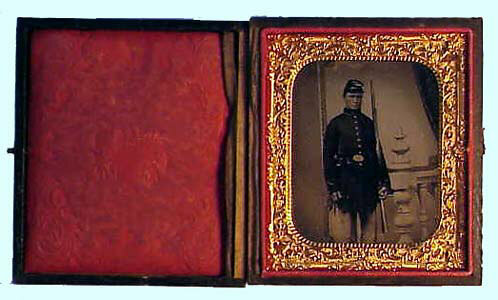 An Ambrotype or Tintype photograph was a one of a kind image and also a mirror or reversed image. In 1854 A.E. Disderi introduced the carte de viste (CDV). These were taken by a camera that produced a glass negitive from which groups of four positive prints of a subject could be made. Some 3000 working photographers produced millions of images using this technique and it is perhaps the most common type of period image of individual Civil War soldiers. These measure about two and one-eighth by three and one-quarter inches and were mounted on cardboard. They were often exchanged with acquaintances. Usually on the back is the name and address of the photographer. 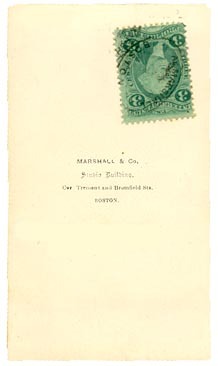 During the years 1864-1866 revenue stamps were affixed to the back of the images. Names may have been written on the photographs, either on the front or back. In most cases these are the names of the individuals photographed, but in some cases they are the intended recipients. During the early war years individual photographs were often full length images. During the later years images were often vignettes, headshots with surrounding detail and torso blurred. These later style images are a disappointment to those looking for details of soldiers' uniforms. Carte de viste photographic images of famous persons were sold commercially by the major photographic studios. These were kept in albums by people, almost in the fashion of more modern baseball trading cards. 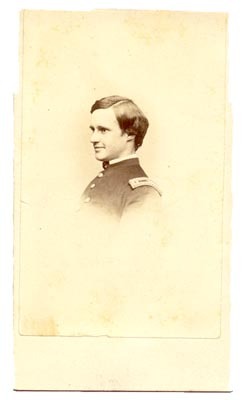 Thus, large numbers of copies of the same CDV photograph of Civil War generals exist. These are multiple generation prints that do not have the quality of detail typical of the original generation prints of individual common soldiers. Single larger images produced by a similar technique were called albumen photographs. In 1866 Cabinet Cards, a larger 4¼ by 6½ format, were introduced and fairly rapidly replaced CDVs as the major photographic format. A word of caution is in order. Not all images that appear to be Civil War soldiers are. People in the 19th Century enjoyed dressing up in uniforms. Many images appearing to be Civil War soldiers are similarly appearing foreign soldiers, post Civil War soldiers, veterans, bandsmen, cadets, members of lodges, children dressed in uniforms, etc. A firm identification of the image is important and preserving the history of any photograph (even your own modern ones) is the duty of the owner. Thanks to Nancy Dearing Rossbacher, David V. Radcliffe and Mike Preziotti for their assistance with this page.